Okay–now they are just rubbing it in. British luxury car maker Rolls-Royce has just unveiled the Phantom Bespoke Chicane Coupe, inspired by the Goodwood racetrack and commissioned by a Dubai-based dealership. Featuring a gunmetal exterior with a matte black hood and windscreen surrounds as well as a set of matching gunmetal wheels, RR is simultaneously showcasing their tasteful motorsport-inspired design acumen and making us drool on our keyboards. 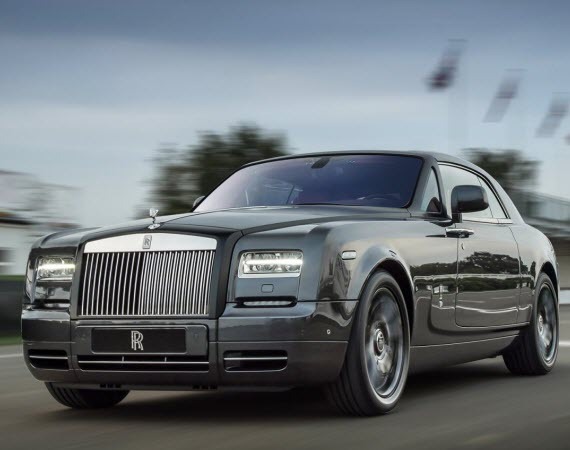 Despite its tweaks, its still a modern Rolls at heart, maintaining the lux red interior decked out with carbon-fiber trim, but the checkered flag motif on the exterior coachline isn’t lost on us. A special one-off build, you can bet that there’s one happy car aficionado somewhere in the Middle East right now. See more reasons why after the jump. via Rolls-Royce Phantom Bespoke Chicane Coupe – FreshnessMag.com.